Maryland criminal defense attorney, Jeffrey Scholnick explains the basics behind the updated expungement law that was recently enacted in Maryland. While people strive to avoid legal issues and penalties, sometimes one situation leads to another, which then leads to an arrest or a criminal conviction. This can result in a tainted record in the eyes of the law or employers. However, in certain circumstances, people can work to remove those blemishes from the public through a procedure known as expungement. Expungement is the legal process of erasing or sealing an individual’s legal record of an arrest or a criminal conviction from the public’s view. The entire process takes approximately 90 days from the date of filing, but more time may be necessary depending on the case. Although the specifics of the laws vary across states and jurisdictions, the majority of expungement laws declare that once an arrest or conviction has been expunged, it is no longer disclosed to the public, including potential employers or landlords, as it is removed from public databases and background searches. Although, it is important to note that arrest records or additional legal information pertaining to a conviction are not concealed from law enforcement officials. As many people have come to discover, having prior criminal charges can have serious consequences in both personal and professional matters, especially when searching for a new job. While the majority of employment applications include a section for recounting previous criminal charges, the applications also typically include a disclaimer saying that having a criminal record does not automatically disqualify an applicant. Despite this disclaimer, one cannot help but wonder if a criminal conviction does play a larger role in an employer’s decision-making process. One of the main reasons why most people consider filing a petition for expungement of records is due to the concerns that having a record will affect their employment aspirations. However, a new law took effect in Maryland on October 1, 2015 that expands the scope of expungements – a move that will positively impact people with a variety of previous criminal records. The updated expungement laws state that everything on an individual’s record can be expunged with the exception of a charge in which that individual was found guilty, in most cases. The biggest change in the law was that it created two types of cases in which a finding of guilt can be expunged. The first group consists of cases in which you are convicted of an act that is no longer a criminal offense, for example, possession of marijuana of less than 10 grams. The second group consists of cases involving a class of minor nonviolent misdemeanors listed in Section 10-105 (a) (9) of the Maryland Criminal Procedure Article. These include urination or defecation in a public place; panhandling or soliciting money; drinking an alcoholic beverage in a public place; obstructing the free passage of another in a public place or a public conveyance; sleeping on or in park structures, such as benches or doorways; loitering; vagrancy; and riding a transit vehicle without paying the applicable fare or exhibiting proof of payment. View more information here. Individuals interested in seeking an expungement still have to wait three years to expunge a STET or PBJ, while a DUI PBJ remains ineligible for expungement. However, if the action has been decriminalized, such as possession of less than 10 grams of marijuana, then you do NOT have to wait three years – you can expunge this guilty finding and conviction immediately. Prior to this law change, if you were convicted of an additional charge after being convicted of an expungable charge, the expungable charge was trapped forever. Now, the charge is no longer trapped, and it remains eligible for expungement. Every individual interested in expungement should know that an expungement of a particular charge can be denied for a variety of reasons, so it is imperative to consult with a criminal defense attorney. Having a record expunged can be a life-changing event, so do not leave it to chance. For more information on the updated expungement laws in Maryland or your individual legal circumstances, contact Jeffrey Scholnick at the Law Office of Jeffrey Scholnick today. 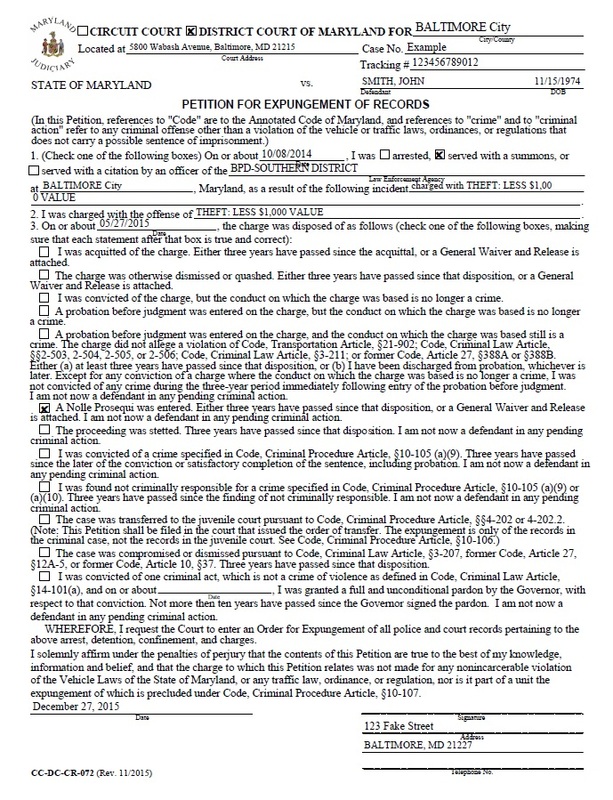 Click here to view the new Expungement form that has been created by the Maryland District Court.